For a 67-year-old patient, Jagdish is quickly mastering the normal looking gait attained by using the LIMBS Knee. His optimism and confidence are contagious to all those around him; he has lived as a double amputee for almost forty years, and serves as an amazing example to the disabled in the developing world of how to overcome adversity that is presented by an amputation. Jagdish lost his right arm and leg on the night of August 18, 1972, and remembers the details leading up to his amputation vividly. At the time, Jgadish was employed as a patrol man for a local train station. He walking along two parallel sets of tracks between two stations; walking on one side, he noticed that an oncoming train was heading straight for him. Fortunately, Jagdish jumped onto the neighboring tracks, straddling the inside rail and avoiding the oncoming train just in time. The last thing Jagdish remembers is hearing the warning of a second oncoming train, and then waking up in the hospital without his right arm and leg. According to witness accounts, after avoiding the first train, Jagdish was struck from behind by the second train. His right arm and leg were pinned under the train, and he was dragged a considerable distance. 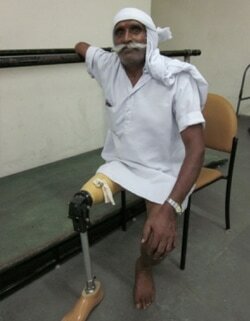 By the time the train stopped, there was no choice but to amputate Jagdish's arm and leg. As traumatic as Jagdish's experience was, he refused to let his disability interfere with his life. Using a heavy, wooden, single-axis prosthesis, Jagdish gained employment riding a bike back and forth from a factory to load up trailers. He has done this for almost 40 years since his amputation. Jagdish also participates in handicapped athletics on an annual basis. After being fit with the LIMBS Knee in August of 2010, Jagdish immediately began to walk with confidence and excellent gait. He noted how much lighter the LIMBS Knee was than his previous prosthesis, and immediately discarded the cane he was using before. Even at the age of 67, when most Americans are thinking of retiring, Jagdish is excited to return to work with his new knee joint, and hopes to continue to serve as an example to the amputee population of India on how to stay positive, and overcome the challenges faced by the disabled community.